Essay: I’ll Do Evil and I’ll Get Rich. You Can Have a Share. Let’s make the future great again. Do you remember when the future was great? I do. Technology was going to fix our problems, changing the way we all live, work and play. That kind of utopian patter was big at the beginning of my career, when the hot new app was … fire. Over time, technologies changed but the overblown promises stayed. The internet was going to give us access to the best of the world’s information. Music services like Napster would be an infinite jukebox, and all free! Social media would connect us with our friends and families (and their pets, and vacation snapshots) and usher in new waves of democracy around the world! Google even started out with a beguilingly simple motto : Don’t be evil. We know how all that’s worked out. A relatively small number of people got rich. And, one by one, many of the companies they started have proved to be — well, if not outright evil, then less than entirely good. A familiar routine has emerged. Social media executives get dragged before Congress, apologize for privacy lapses, political manipulation and virulence, and promise to do better. Trust us, they say. But I can’t help but feel that these titans of industry are missing the point. They say they are sorry for committing blunders, but these aren’t bugs in the system; they’re the core of the business model. Selling us out is, after all, just another kind of selling. No matter how they dress things up with rosy language, their real goal is making themselves, and their angel investors and venture capitalists, obscenely rich. I’m not against obscene wealth, by any means, except for one question: How can I make obscene wealth part of my own future? I do have a business plan: Be upfront about being evil. Honesty, about my fundamental dishonesty, will be efficient. As a wicked tech overlord, I’ll save so much time, once I’m drinking The Macallan and driving a McLaren, by never having to say I’m sorry — to Congress or anybody else. From the get-go, I’ll say what I’m doing is bad. The idea is so simple, so beautiful, that it amazes me that no social media magnate seems to have thought of it before. Besides, consumers might appreciate honesty. I know. That’s a crazy thought. Facebook, he said, makes us dumber as a society:” It “cuts and dices” experiences and serves them up as junk food for short attention spans. Serious discussions? Boring. But generate strong, powerful passion and it’s clickety click click, whether the issue is poor kids getting into Harvard or conspiracy theories about pizza parlors and pedophiles. You can bet I was taking notes. This was quite an instruction manual. I explained my plan to create a purely evil social network that will be unabashed about its badness. My company will peddle nothing but clickbait, especially nutty conspiracy theories. Did you know that Hillary Clinton is having an affair with space aliens? They think she’s likable! Also, Donald Trump has already built the wall, but you can’t see it because it’s INVISIBLE. Winning! This stuff will be as rich in empty calories as a bag of potato chips and as addictive as cigarettes, but even worse for you. And those businesses are perfectly legal, so why not mine? He didn’t hang up on me, which has happened when I have tried to share my boldest ideas. But he told me I was too late. At this point, he said, no one can start a big new social media platform because the current leaders are too well entrenched. He explained that Facebook, for one, has billions of users and tens of billions of dollars in annual revenue, not to mention more than a decade of valuable user behavior in its servers. “That kind of wealth of scale and data is insurmountable,” he said. Fine. 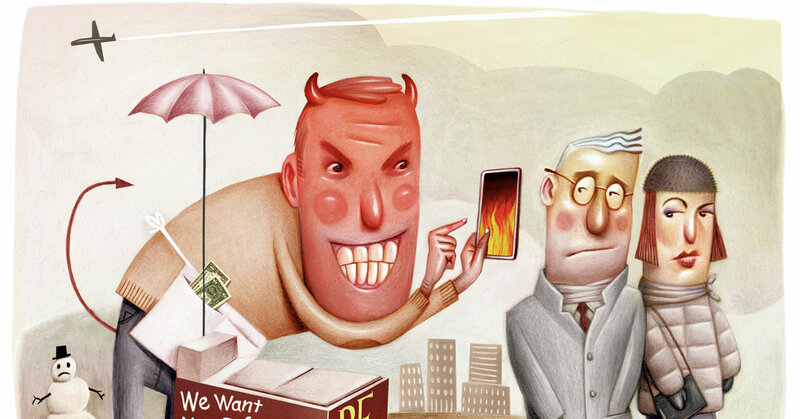 The do-evil approach can work in businesses beyond social media. Banking is a great field. I will come up with a mobile app that lets you know right from the start that we are going to sign you up for accounts and lines of credit you don’t want but for which you will pay hefty fees. We will persuade people to accept this abuse by explaining that we are utterly incompetent — so hapless that we might just forget your mortgage, so you get a free house. Banks have done these things before, but they have lacked evil transparency — and that’s my motto. Even if I don’t create an entirely new social media network, there are always opportunities for evil consultants. Sites like Twitter are already littered with vicious insults, but they are just so amateurish. I will create a personalized service that is thoroughly professional, using insult comedians along the lines of Don Rickles. People like Lisa Lampanelli and Vinnie Favorito will beam individualized abuse right to your cellphone. Good Americans already pay for this kind of thing in Vegas. But we will abuse them online, in their pajamas. Wait. The customers will be wearing their own pajamas. But you get what I mean. Looking for more insights, I called Anand Giridharadas, author of “Winners Take All: The Elite Charade of Changing the World.” I tried to explain my concept, but he misunderstood. “There’s just an amazing play out there for a tech company that actually wants to do what tech companies say they are about,” he said. No, no, no, I explained. I just want to be honest about being bad. He pondered and turned his argument around with remarkable agility. “I would so appreciate companies that were straightforward about their predation, and I would have respect for them,” he said. Of course, he said, Washington would need to regulate my evil entity. That was disappointing. But he had a helpful suggestion. I liked the sound of that, the phony part especially, and will definitely earmark a small portion of my first billion for pretending to make the world a better place. I can be magnanimous. But I’ll be open about my core business: It is evil. And I’d even go public with it. That way, as my hero, Milo Minderbinder, put it in the great how-to book “Catch-22,” everybody can have a share. If you need me, I’ll be on Twitter, yelling at somebody.